When Hurmazd II died, the Persian nobles were determined to show their power. None of his three sons was allowed to succeed (although one, another Hurmazd, escaped and fled to the Romans - more will be heard of him). Instead there was (allegedly) the most bizarre coronation of all time: Hurmazd II's unborn child was made king of kings while still in his mother's womb. The Magi had foretold he'd be a boy. The nobles assumed they would continue to hold the real power. But while Shapur was growing up, things had already started to go wrong for them. The re-appearance in Iran of warlike nomads from the steppes to the north east. While Shapur II was still a boy, the Arabs from the southern side of the Persian Gulf began a series of attacks across the gulf into Persia and Elymais, growing bolder and more aggressive as Shapur's regents did little to discourage them. They even planned an assault on Ctesiphon. Believing no one would stop them, they eventually decided they could colonise the northern coast of the Gulf. They were wrong. By now Shapur was old enough (aged 16 in AD 325) to take charge. The Savaran cavalry soon drove the Arab occupiers out of Persis and Elymais, and Shapur then led a counter-invasion of Bahrain and the Arabian coast. There was large-scale slaughter. Shapur's treatment of his prisoners was remembered by the Arabs as especially brutal - they called him "the shoulder-piercer", because he roped his captives together through their shoulders. 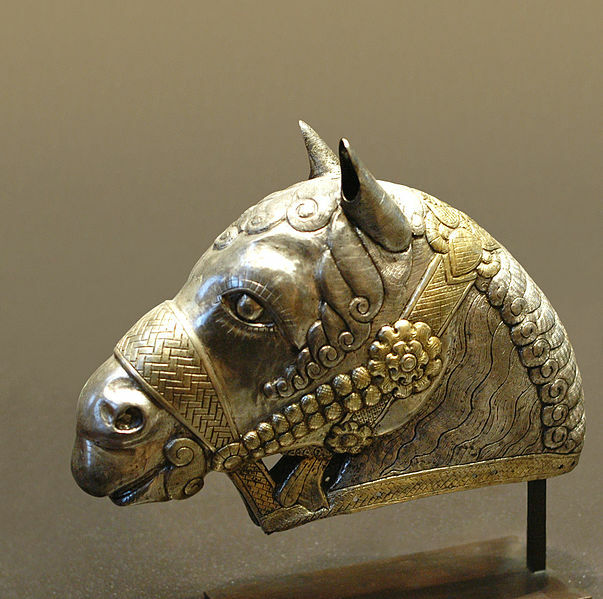 Head of a cavalry horse, 4th century AD. Found at Kerman, central Iran. Many Arabs were transported to underpopulated areas of Sasanian territory, like Kerman or Khuzistan. Those who stayed in Arabia were pushed away from the coast, so that the entire coastline of the Persian Gulf came under Sasanian control. The Lakhmid dynasty of Arabs, who lived west of the Euphrates in southern Iraq were befriended by Shapur II to form a buffer against the other Arabs to the south (Bedouin) and west (Ghassanids), and the Romans. Thus Shapur II partly executed the strategy which the Sasanians could have adopted earlier if they'd supported Palmyra against the Romans. Arab invaders from the south of the Persian Gulf take advantage of lack of authority while Shapur II is still a boy. But when he grows up, he drives them back and punishes them severely. This is the first inkling of Arab-Persian hostility, which would reach its finale in the 7th century. Their origins and ethnic identity is not certain (quite probably they were the Xiongnu), but some were at least distantly related to the current peoples of the Iranian plateau - they are variously called Chionites, Kidarites and Huns. In AD 358 Shapur II made a peace treaty with a group of these nomadic warriors from central Asia, defusing the problem - for the time being. The main source for the war with the Arabs is a Zoroastrian compilation dating from 8-9th centuries called the Bundahishn. 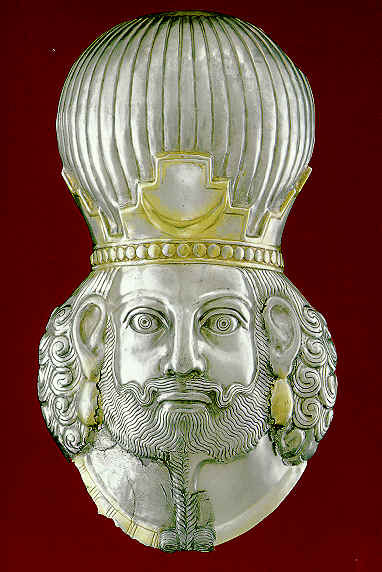 There had been a satrapy called Arabaya under the Achaemenids (listed by Darius I). 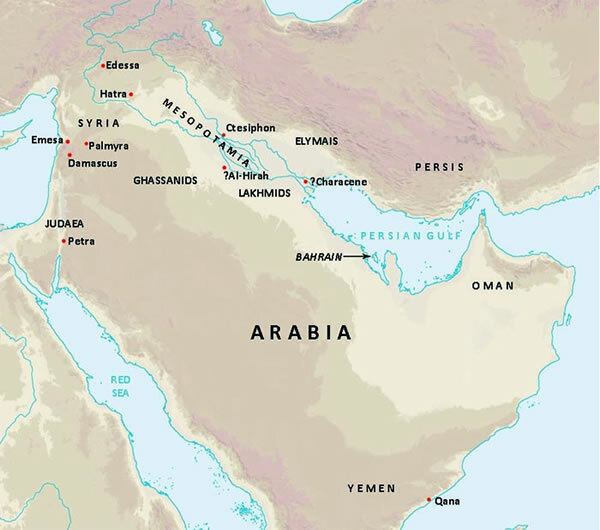 The Arabs in northwestern Arabia had been subsequently ruled by the Seleucids, and then the Parthians. There'd been a semi-independent Arab kingdom at the head of the Persian Gulf since 127 BC - known as Characene (Charax) or Mesene. See also Arabia page. The memory of their treatment by Shapur II was passed down through the generations by the Arabs. They were eventually to have their revenge. The Lakhmids were Arabs who had earlier migrated fom Yemen and were settled in Mesopotamia. They were trained in Sasanian fighting techniques and did a good job keeping the peace. Shapur also built a wall to stop the desert Arabs invading. The Lakhmid king, Imru' al-Qays ibn 'Amr, converted to Christianity - and styled himself (somewhat prematurely) as "king of all the Arabs" [Source: his tombstone in the Louvre]. The city of Hira,the Lakhmid capital, replaced Hatra (which had been destroyed by Shapur I) as the main Arab centre in Mesopotamia.